Congratulations, on being accepted into the Adult Degree Completion (ADC) program at William Jessup University! We are looking forward to serving you, and are making plans for your attendance. 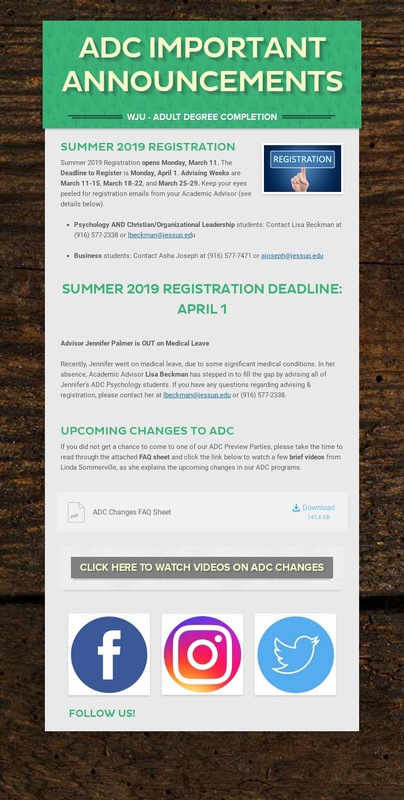 * my.jessup.edu is WJU’s Intranet and your gateway to Jessup Email, Moodle, and your Student Portal (log in by clicking the links on the top menu bar of My Jessup). 2. Important: Please complete these forms before your advising appointment. Please note: New students will be automatically registered for their first semester of classes. Once registered, you may view your schedule on your Student Portal. If you have questions or concerns regarding registration or classes, please contact your Academic Advisor (see below). 5. Manage your textbooks here once your registration is complete. 6. Register for your WJU Parking Permit. 7. Forward your email to make sure you don’t miss important WJU communication.